A man has had part of his scalp ripped off by a wild leopard, which became panicked and attacked four people when it walked into a bustling residential area in India. 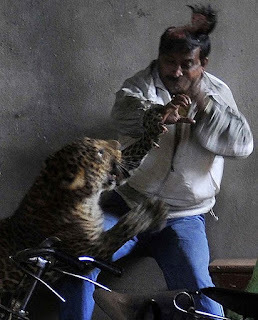 The fully-grown leopard set upon the group when it walked into a house in a busy neighbourhood of Guwahati, a large city in north east India. Dramatic photos show the leopard lashing out at a man, identified by Indian media as a cook named Hari, whose scalp is severely cut as he tries to fend off the animal. 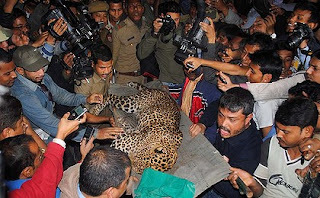 One man managed to shut the leopard inside the house before forest officials came to sedate it, The Daily Mail reported. Hari was taken to hospital for injuries to his head and face, while the leopard was taken to a zoo for observation. "We believe the cat strayed into the area from a nearby hillock, maybe in search of food," a forest department official said.Tranquilised ... the leopard was taken to a zoo. Thousands of people gathered in the streets to catch a glimpse of the leopard, which only made the animal more anxious, Yahoo News India reported. Animal workers took 45 minutes and three shots to tranquilise the animal. "Our people need to be sensitised," said Surajit Dutta, director of the Kaziranga National Park. "You traumatise an animal like this and it will attack. You let it pass, while informing us, and it normally will. We can then get the situation under control as our people are trained to do this." Guwahati is close to the dense Garbhanga Forest.